Each year over half of College Members are living away from home for the first time. This can be difficult, but it is also an exciting time where Members meet new people from different parts of the country and world. Although new Members may feel homesick in the first few weeks, our experience is that the College quickly becomes “home”. This is facilitated by the College being divided into smaller sections (floors and houses) under the care of a College Leader whose primary role is to care for Members. Our advice to new Members is to participate in College and floor events as much as possible, and engage in conversations during meal times in the Dining Hall as this helps in making friends and connections. These things will also be of huge value during the usual stresses of academic life. Of course, our three core values (the three Cs) of courtesy, consideration for others and common sense go a long way in ensuring that the College is a home away from home for all Members. A team of 13 College Leaders assist the Master and Dean of Students in the leadership of the College by providing a welcoming, homely, caring, supportive and sought-after environment in which Members can thrive in all respects (academically, personally and socially). Each floor and house has a College Leader who is available to assist Members with queries, ill health matters, advice, friendly support, a listening ear, encouragement, study issues, etc. Please feel free to contact your College Leader at any time; their role is to assist you. If they are unable to help themselves, they will refer you to some who can. College Leaders also arrange floor activities and meetings, many of which Members are expected to attend (i.e. they are compulsory). By accepting a place at the College, Members are agreeing to actively participate in College activities, all of which helps to establish a sense of community (this can’t happen on its own; your involvement is essential!). Any problems relating to floor discipline and order should be discussed with your College Leader in the first instance. These kitchens are available for Members' use. There are cupboards and a refrigerator available for storage in each floor kitchen, but please name your goods. The College provides a stove, an electric jug, an iron and ironing board, a toaster and a microwave. Studying at University level is very different to that of school and often means that students need to adapt their study approach. To help with this, at the start of the year, College Leaders give study skills advice and returning Members also help to advise first-year Members about different disciplines. Where required, the College provides free tutorial classes for Members. The College monitors the effectiveness of its tutorial programme and has Members fill in an attendance sheet for each tutorial. Tutorials for second year subjects are also offered but on a more limited basis. In the past, those who have taken advantage of the tutorial programme have performed well in examinations and had good results in selection for professional programmes at the University. Members are encouraged to let the Dean of Students or their College Leader know if they are having difficulty with a subject. Sometimes individual help can remedy this, but if it is a common problem, the College may arrange a special tutorial. The Dean of Students manages the tutorial programme. First-year Members are encouraged to join special mentor groups led by returning Members who facilitate subject discussion in a small group environment. The Dean of Students manages these mentor groups, which form a fundamental part of the St Margaret’s system. As a condition of residence, the College requires Members to authorise the University to supply the Master with academic grades for the years they are in residence. This enables the College to assist Members academically, to monitor its tutorial programme, select returning Members, etc. The Master, Dean of Students, and College Leaders are happy to help Members who have queries or concerns about study-related matters. Please do not hesitate to let your floor’s College Leader know if you are sick or injured or have any other health-related issues that the College needs to be aware of to support you appropriately. College Leaders also have access to first aid equipment and are trained to use it. If a Member is unwell and unable to get to the Norris Dining Hall for a meal, the floor College Leader will arrange a tray meal in their room. The University’s Student Health Service offers fully qualified medical treatment and counselling during office hours. It is located only a short distance from the College in Albany Street. If your work has been affected by illness, it is a good idea to ask Student Health for a medical certificate to that effect. An after-hours medical service is available through Dunedin’s Urgent Doctor Service or the hospital’s Emergency Department. When it is possible and necessary, College staff will assist with transporting Members to Student Health, Urgent Doctors or the Emergency Department at the hospital. As the College is not a therapeutic community and does not employ any specialist health services staff, it may not be able to meet an ill Member’s ongoing care needs. In such cases, the College will normally require that the Member not be in residence. This may include either a temporary period of absence from the College for recovery purposes at home or elsewhere, or the permanent departure of the Member. If a Member is a threat to themselves or to the safety of others, the College will normally require the immediate and permanent departure of the Member. In keeping with University policy, the College’s buildings and grounds are also designated as non-smoking areas. If you wish to smoke please do so away from College and University premises (including driveways and carparks). The College works closely with the official University chaplains, one of whom acts as the College Chaplain, and fosters involvement with local churches. Names of chaplains and times of services at local churches are posted on the notice board by the College Chaplain who is also a College Fellow. The College Chaplain is an interdenominational and interfaith chaplain, so also liaises with other faiths. Returning Members can assist first-year Members with locating an appropriate church in the first few weeks. The College has a proud tradition of cultural achievement. We complete annually with Salmond and Studholme Colleges for the Iona trophy. In its long history, we have won it more times than anyone else! We compete for it through debating, choir, and public speaking. The College's choir is of a very high standard, and is often asked by the University Chaplains to perform for graduation thanksgiving ceremonies. Our Sunday Formal Dinners provide a wonderful opportunity for the musicians amongst us to entertain the College with their talent. The University’s Inter-college Cultural Competition runs throughout the year and provides many opportunities for Members to participate in different types of activities. The Otago University Students Association (OUSA) also provides a huge variety of clubs and societies for you to join. You certainly won’t be bored! The College has a Music Room with an excellent practice piano and keyboard. There is a baby grand piano in the Valentine Common Room, a piano in the Study Centre, and another baby grand piano in the Norris Dining Hall. The Music Room piano may be used for practice at any time outside of quiet hours. A booking sheet behind the Music Room door will enable people to book practice times for the week ahead. The Sibelius music composition programme and a midi keyboard is also available in the Music Room. So that individual music students always feel free to practice, the Music Room cannot be used for private academic study. The Valentine Common Room piano may be used until 11:00 pm Sunday to Thursday, and on Friday and Saturday, unless instructions are given to the contrary. To avoid disturbing people studing in the Library and small tutorial room, and B floor residents, please ensure that the hallway door is closed before playing the piano. The College makes every effort to ensure that people from all cultures feel welcomed and cared for. The College has links with the University’s Te Tumu School of Māori, Pacific and Indigenous Studies, the Māori Centre and the Pacific Islands Centre Members of the College are encouraged to use the services they offer. St Margaret’s College places a high emphasis on community involvement. To start the year, rather than having initiations (we don’t do those! ), we take part in a community service project during Orientation Week. In the past, these have included helping to build an entire house for Habitat for Humanity, working with Te Araiteuru Marae and assisting at the Orokonui Eco Sanctuary. Towards the end of the year, we have an evening of performances for Friend-Link, an organisation that helps people with special needs. This is a lovely night of entertainment for them, and is always a highlight of the year for the performers. The College provides a supper afterward where Members serve the guests. Members are also encouraged to take part in other volunteering activities which are facilitated by the University’s Volunteer Centre and in community organisations. In the sporting arena the College contests for the Southgate trophy with Salmond and Studholme Colleges, and we participate in the University’s Inter-college Sporting Competition in a variety of sports, for example soccer, volleyball, cricket, basketball, futsal, hockey, and eSports. During Orientation Week, the entire College participates in the fun Inter-college Sports Day. Often Members of the College will organise social sports teams, and of course you can also get involved with University and community club sports. The College has a tennis court for Members to enjoy. It also doubles as a basketball or netball court or backyard cricket ground. UniPol, the University's well-equipped gym and recreation centre, is just a five-minute walk from the College and is free to use for all University students. The Master will regularly remind Members of the importance of keeping a balance in order to succeed academically and manage stress. In addition to attending to your studies, you should make sure that you get sufficient sleep, undertake regular exercise of some sort, spend time socialising with others, and do other things that you enjoy. 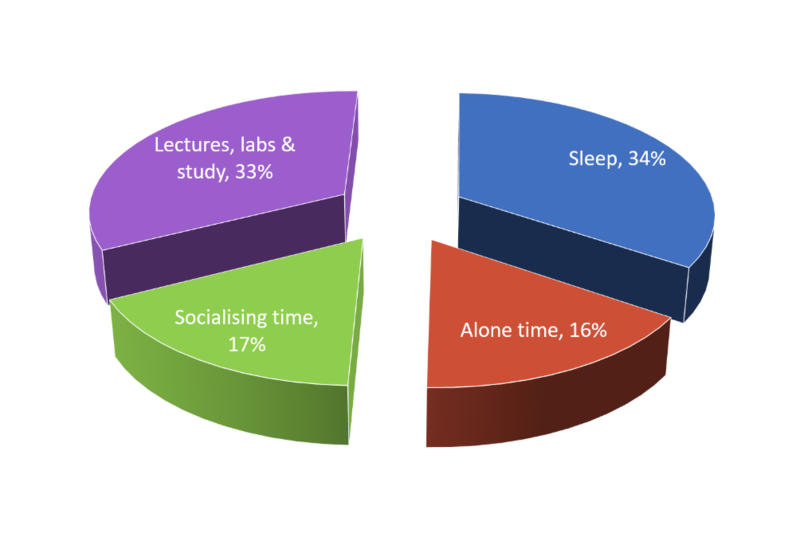 Use the following diagram to help you plan how you spend your time each day. Members having difficulties during the evening should contact the duty College Leader in the foyer. During weekends, problems should be referred to the College Leader on duty whose name is posted in the window of the Administrator’s Office. College Leaders have delegated authority from the Master. Members should be aware that study, behaviour and health matters are not confidential to an individual College Leader but to the team of the College Leaders, the Master, and the Dean of Students. This is important for pastoral care purposes. Members are asked to please not put individual College Leaders in a difficult position by asking them to keep such matters confidential to themselves. Because the Master has concern for the whole College, the College Leaders are obliged to consult with the Master. The Master will only share personal or sensitive information on a "need to know basis". College Leaders may suggest to Members that it might be more appropriate if some matters are shared with a Student Counsellor, a Chaplain or other support service provided by the University, the Otago University Students Association (OUSA), or some other community service organisation.